Buy the pattern on Etsy or Ravelry, or look into getting this blanket as a custom, handmade piece. 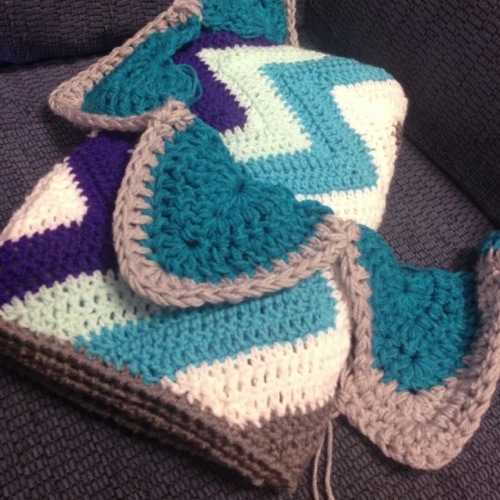 See a gallery of my Chevron blankets on the Main Page. 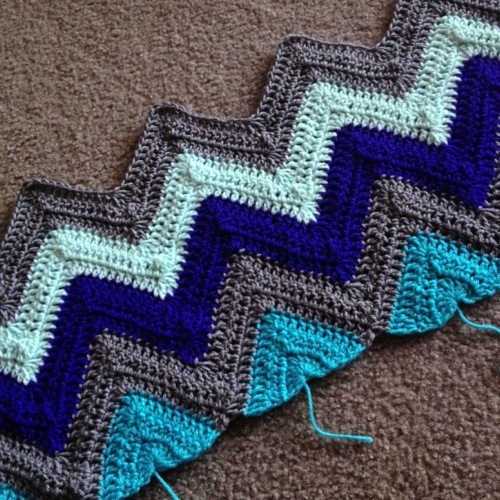 I only took three pictures of this one, and the final shot (shown above) includes another Chevron2.0 in progress! The blanket in progress is an Extra Thick order, so I have Worsted Weight yarn held double with a size 10mm hook. As usual, I made a couple of small alterations to the pattern to mondo-size it. You can see what a difference it makes going from Standard Thickness to Extra Thick. I love both for this design. On each project I take any opportunity that I can to start the next color with the current color still in progress. This way I am more motivated to keep moving through a piece, and I get less distracted. See it in action above! 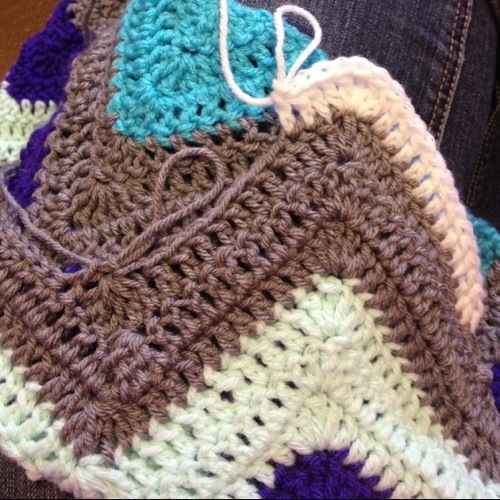 Posted in ChevronTagged Back and Forth, Chevron, Crochet, Stripes, Tip: SpeedBookmark the permalink. Such pretty colours, I like the way you have filled in the V at the start to create the straight edge.